The Central High School Players are back at it again and ready to blow another audience away. Auditions for the state one act, Crisis and student directed one act, Whodunit? took place last Monday through Wednesday and the cast list was posted Thursday. The cast of Crisis consists mostly of strong juniors and seniors who have attended the state festival before, however there are some upperclass faces new to the theatre department who were also cast in the show and who are ready to make their debut. Among these people are seniors Drew Stephens, Rourke Massey, and Johnathan Nickel. The assistant director is Timarie Berman, who was formerly the assistant technical director for A Midsummer’s Night Dream. Whodunit? will be directed by none other than the assistant director for last year’s production of Ghost Busters and our National Honor Society Co-President, Jenna Severson. Severson’s assistant director for this show is junior Lacy Thormahlen. The cast has a broad range of ages and stage experience. Among some of the new faces in this show include freshman Shelbi Blankarts and senior Ryan Styles. Whodunit? is a mystery-farce by Anne Coulter Martens. This comic spoof consists of an array of silly characters and excitement: Was it the butler? Alice? Grandma? The Detective? No one knows! 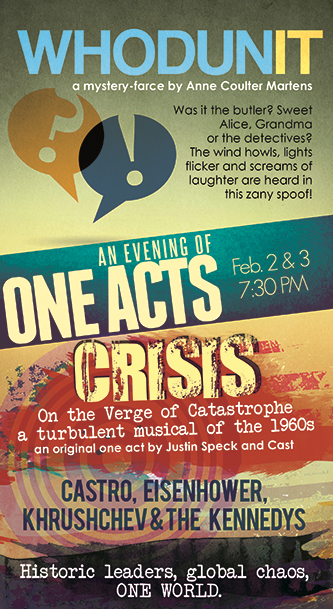 The Evening of One Acts will take place just two nights on Feb 2nd and 3rd at 7:30pm! So stay tuned for tickets to go on sale a few weeks before the show and don’t miss your chance to see them!